Perfect for formal wear or when you are looking to ad a playful touch to your every day appearance, these box chain love knot earrings in 14K gold from Apples of Gold Jewelry really steal the show! 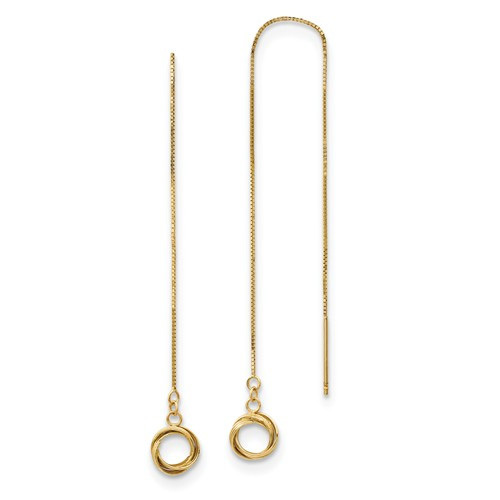 The earrings measure just over 2 1/2 inches in length, and feature a rounded love knot with a large open circle in the center at the end of a long chain. These fun earrings are great for adding a fun touch to any occasion, and the warm 14K yellow gold appearance make them elegant. These lovely earrings have the perfect amount of feminine touches and are sure to be cherished! We guarantee our Box Chain Love Knot Earrings, 14K Gold to be high quality, authentic jewelry, as described above.